Throughout the last 140 years, the Siebel Institute has attracted an extensive global following. Our alumni span more than 60 countries and are found in almost every major brewery on earth. Our classes include a mix of participants from breweries of all sizes who hail from locations all over the world. This broad base of participants enhances the learning opportunity of each student by exposing them to differences in culture, equipment, methods and beer styles. In our formal lectures and demonstrations though, we focus their attention on one common theme: beer. Students may come to the Institute with the biases of their own particular brewing environment, but they all leave in the simple and honest camaraderie of being a brewer. We have a saying here at the Institute: "Not only do we teach our students, but we also help them to teach each other." The Institute continues to focus on one basic theme as was published by Dr. J. E. Siebel in an ad in an 1893 Western Brewer. He stated, "The object of the Institute is to promote the progress of the industries based on fermentation, which is done by instruction, investigation, analysis and otherwise." 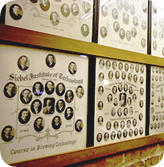 The Siebel Institute of Technology and World Brewing Academy have been an important part of international brewing history for over 140 years, and we look forward to welcoming the future generations of brewers to our home in the heart of Chicago. Think “forefathers of American brewing,” and names like Busch and Stroh come to mind. But equally notable is John Siebel, the founder of Chicago’s own Siebel Institute of Technology, a 143-year-old leader in brewing research and education that has taught both of the above dynasties a thing or two about beer. Dr. John Ewald Siebel founded the Zymotechnic Institute in 1868. 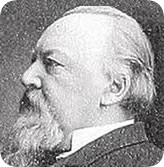 He was born on September 17, 1845, near Wermelskirchen in the district of Dusseldorf, Germany. He studied physics and chemistry and earned his doctorate at the University of Berlin before moving to Chicago 1866. 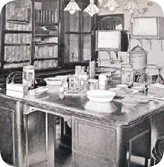 In 1868 he opened John E. Siebel's Chemical Laboratory which soon developed into a research station and school for the brewing sciences. In 1882 he started a scientific school for brewers with another progressive brewer but the partnership was short lived. Dr. Siebel did, however, continue brewing instruction at his laboratory. 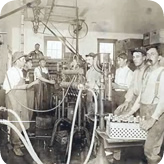 The business expanded in the 1890's when two of Dr. Siebel's sons joined the company. The company was incorporated in 1901 and conducted brewing courses in both English and German. By 1907 there were five regular courses: a six-month Brewers' Course, a two-month Post Graduate Course, a three-month Engineers' Course, a two-month Maltsters' Course and a two-month Bottlers' Course. In 1910, the school's name, Siebel Institute of Technology, was formally adopted. With the approach of prohibition, the Institute diversified and added courses in baking, refrigeration, engineering, milling, carbonated beverages and other related topics. On December 20, 1919, just twenty-seven days before prohibition became effective, Dr. J. E. Siebel passed away. The fourth generation, represented by Ron and Bill Siebel, joined the Institute in the 1960's. In 1974, they helped introduce the concept of shorter courses. These courses, at two weeks or less in length, were designed to meet the specific training needs of a changing brewing industry. The longer Diploma Course in Brewing Technology has been maintained to this day as the in-depth course of study for the experienced brewer who wishes to maximize his career training. 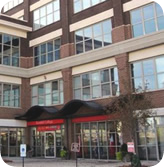 In 2013, the Siebel Institute of Technology moved into its new campus facilities at 900 N. North Branch St. in the facilities of Kendall College in Chicago. 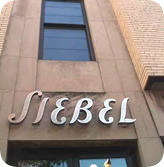 The new Siebel Institute campus has incorporated many of the elements of our previous locations including the bar and furnishings from the famous Bier Stube, a favorite spot where students socialized after a hard day’s study. Siebel Institute of Technology is approved by the Division of Private Business and Vocational Schools of the Illinois Board of Higher Education.